NOSE: 21 years of sitting in Oloroso and PX casks have done wonders for this single malt. Who knew something so dark could smell and taste so fruity, rich and spicy. Brown sugar blasts through, dragging sugar in the raw with it, caramelizing on your tongue to a rich and crunchy English toffee. The brightness of Pink lady apples and tart dark cherries snaps like a SlimJim in your nose. And this is all before you even take a sip. Take a moment to let the spirit breathe and fill the room and no doubt you’ll nose the heather off in the distance and the whiffs of tobacco leaves being dried, not smoked. Add a few drops of water and the red fruits get accentuated and then coated with sticky caramel and toffee pudding. If you don’t understand what I mean, It’s rich, rich, rich in the nose. PALATE: The first thing I taste is the delicious fruitiness and the roundness of the two sherries. A slight smokiness or old wood flavor pushes its way through, possibly from the Pedro Ximenez influence. Even at 48% abv, I could drink this neat all day…I would be passed out with possibly less clothes on, but it’s definitely a slow easy drinker. There’s a lot of nuttiness and baking spices, like someone just baked a “fresh out of the oven” minced meat pie but added toasted hazelnuts, just because. The addition of a few drops of water increases the sweetness on the tongue and boosts the nutmeg, cinnamon and cardamom spices deliciously. FINISH: The finish is long and lasting and utterly balanced. I did experience some mid-palate astringency, but that was easily forgotten with another delicious sip. Many of the 21 year old single malts that I’ve tasted felt light on the tongue and aren’t as rich as I’d like them to be. 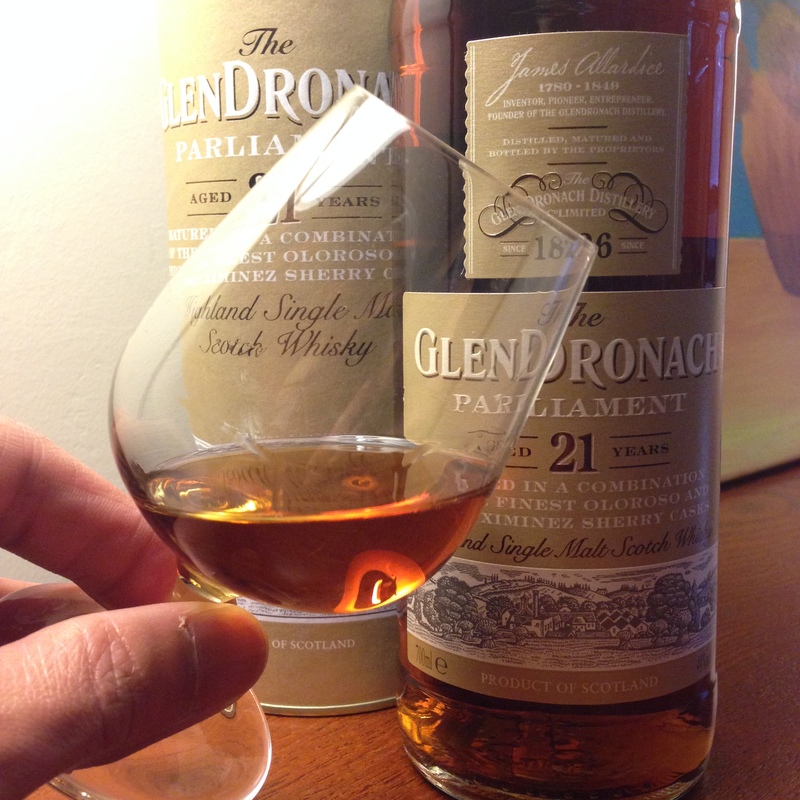 Enter GlenDronach 21. This single malt maintains the heavyweight feel and richness that I have looked for, all while balancing toasty oak, baking spices and sweetness. Definitely one to look out for or order, if you can find it for less than $150.